Pest management is an important aspect of agriculture, shade tree maintenance, and forest health. 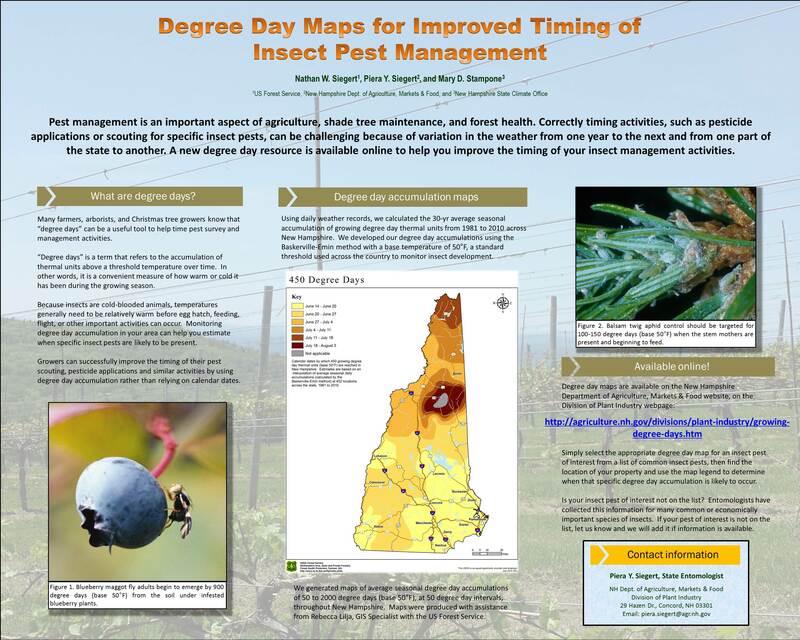 Correctly timing activities, such as pesticide applications or scouting for specific insect pests, can be challenging because of variation in the weather from one year to the next and from one part of the state to another. 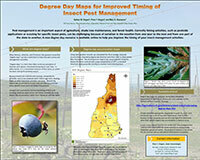 The growing degree day (GDD) resources below are available to help you improve your insect management activities in New Hampshire. Under "Product", select "Accumulation graphs"
Under "Options", click the "Variable" pulldown menu and select "GDD base 50"
This project is the result of a cooperative effort between the New Hampshire Department of Agriculture, Markets & Food, the New Hampshire State Climate Office, and the US Forest Service, Northeastern Area State & Private Forestry, Forest Health Protection.